It was big news when NBA superstar Steph Curry chose to not go to the White House with his Golden State Warriors team to meet President Donald Trump after winning the 2017 NBA Championship. But he's just one player. After voicing his decision, President Trump uninvited the entire Warriors team. Next to opt out of a White House visit was the entire Women's Basketball team from South Carolina. The team, which won its first NCAA championship in April, was invited to attend a reception at the White House, but declined the invitation. It's not only athletes who are refusing invitations to the White House. It will be very interesting to see how many Jewish leaders opt out of attending the annual Hanukkah reception at the White House next month. Invitations have already gone out and presumably only rabbis and other Jewish leaders the Trump Administration thinks would accept have been extended an invitation. However, there are likely to be many invitees, even ardent Trump supporters, who will cave to pressure and choose to not attend the Hanukkah party at the White House this year based on actions and public statements by the President himself. What's interesting to note is that, while there hasn't been any news yet about people refusing to attend the Hanukkah party, there has already been talk of a Reform rabbi who has turned down the White House's request to borrow a menorah from the synagogue to be kindled at the reception. Just got off the phone with someone in Washington, D.C., who is helping to plan the White House’s Hanukkah Banquet this year. It seems the White House was interested in borrowing a special hanukkiah to use in this year’s celebration. I told her we are honored to be asked. I told her I wish I could say yes. I told her that Hanukkah’s celebration of religious freedom, spreading light in the face of darkness, cultivating hope instead of fear, is antithetical to everything this White House has embraced. I told her we would have to say no. Then I received a second phone call, that this conversation should be kept confidential. I asked why. Because it wouldn’t be appropriate, I was told. Because this is how things are done in Washington, D.C., I was told. I told her I would take that into consideration. And then I wrote this post." I'm sure this wasn't an easy decision for the rabbi to make because there's a certain amount of clout in having your menorah be the one used in the White House. 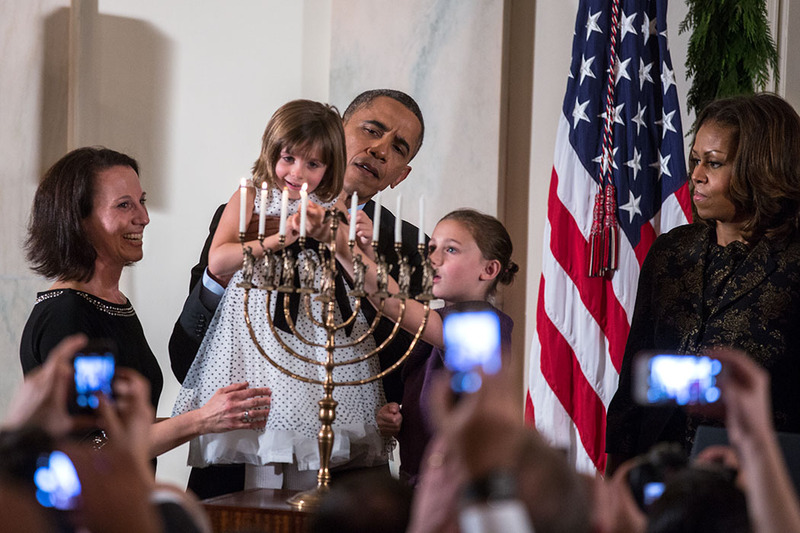 After all, most menorahs that are borrowed by the White House to light at the annual White House Hanukkah party are already famous or have some meaning as to why they were used. So, already an NBA star, a women's college basketball team and a menorah have opted to dis the President and stay away from Trump's White House. It will be interesting to see who else does. It's a very strange psychosis. Obama was not pro-Israel yet reform rabbis and organizations such as JStreet fawned over him. Trump is pro-Israel yet these very same rabbis and organizations keep insulting him. Ghetto mentality?!! Self-hatred? How about Jewish values? Let’s throw them out just because you think 45 is pro-Israel?!! This one-issue outlook is a sad choice for any Jew least of all human being. This man is a despicable pig as evidenced by his words & actions. Kudos to this Rabbi & anyone who stands up to this con man. And hilarious that you think he’ll be all that for Israel!